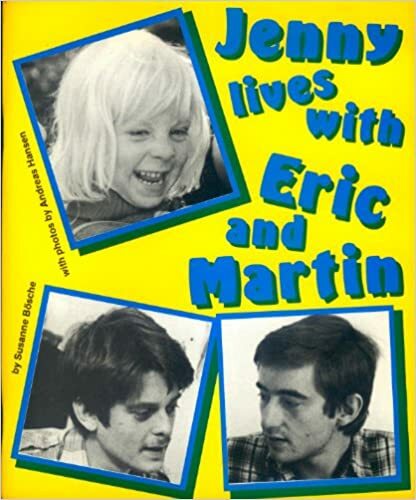 Originally published in Denmark, Jenny Lives with Eric and Martin, written by Susanne Bosche and translated from Danish by Louis Mackay, was published by London’s Gay Men’s Press in 1983. The wordy text, printed in green font, is accompanied by realistic photos of two men and their daughter, Jenny. Jenny’s biological mother lives near the couple and visits frequently. The family is depicted completing everyday tasks from cooking and cleaning to organizing a birthday party. The text takes homophobia on by depicting the angry reaction of an older woman the family accidentally bumps into while walking down a street. She makes homophobic comments that Jenny overhears, which prompts Jenny’s dads to explain why some people are homophobic through chalk sketches depicted in the text as a mini-comic book-style insert. Overall, I appreciate the depiction of a queer family arrangement, and the everydayness of the settings the family negotiates. However, the book has not aged well, in part because of the realistic photo depictions of the family. Additionally, some images depict Jenny and her dad’s in bed when they are naked. This is an odd choice. Although the images are intimate without being inappropriately sexual, they are awkward. I also found the book far too wordy and slow-paced for its intended audience. I understand the desire to meander through the lived experience of two men raising a child, but the book didn’t hold my attention and I can’t imagine children finding it very engaging. This is an interesting piece of LGBT history worth reading/collecting if you are an adult building an archive, but I don’t recommend it for young readers.